NES The Last Ninja (USA) in 08:01.11 by was0x. 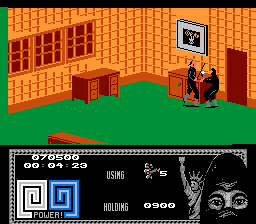 The Last Ninja is a port of System 3's The Last Ninja 2 to the NES. It follows the plot of the original game, namely that Armakuni is mysteriously teleported to modern-age New York City to defeat the evil Kunitoki once again. Notable changes in this port are vastly different music and less graphical detail. This is an improvement of 15.65 seconds over the previous movie, thanks to better optimisation and jumping to a transition screen.